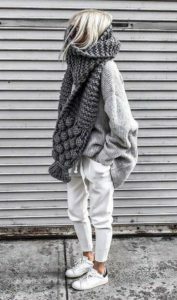 The grey sweater is one of the most versatile items of clothing there is. 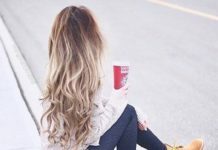 It can be worn in so many different ways, from the casual and relaxed, to chic and dressy. Invest in a good quality grey sweater and it is sure to become one of your favourite go-to pieces when you are not sure what to wear. Whether you like chunky oversized knits, fine knits, or a classic cardigan there is sure to be a grey sweater for you. 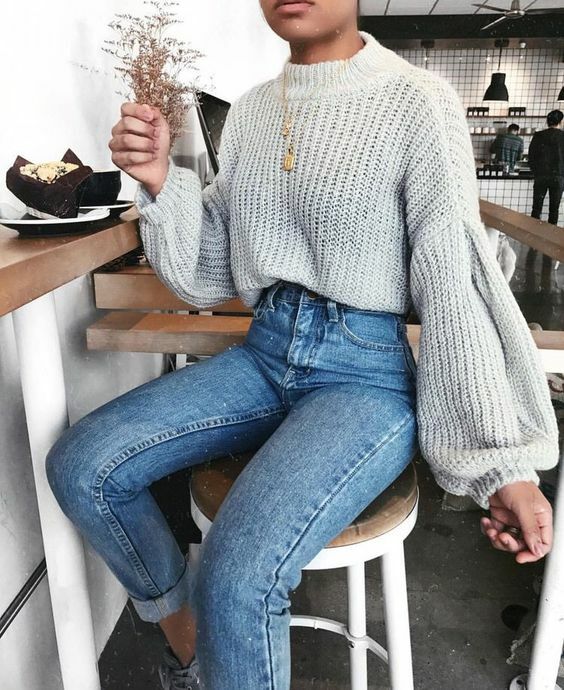 If you are looking for some inspiration on more ways to wear this wardrobe staple, check out some of our favourite grey sweater outfits. A cute grey sweater dress can be worn in so many ways. Here is looks gorgeous teamed with thigh high boots, perfect for a night out. But, it would look just as good worn with leggings and sneakers for a day relaxing at home. This outfit looks so snug and warm with different kit textures mixed together. Perfect for a colder day, where you still want to look chic and stylish but don’t want to sacrifice warmth. 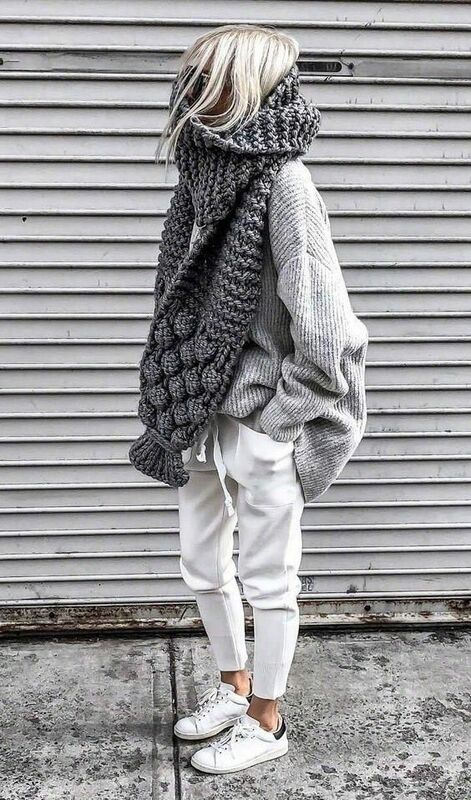 An oversized grey roll neck sweater, jeans and sneakers is a great go to outfit for the weekend. Simple, stylish, and functional! 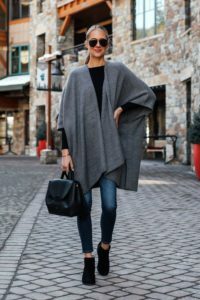 The wrap around sweater is so great and it nips you in at your smallest point creating a gorgeous silhouette. It looks gorgeous teamed with these distressed skinny jeans and to die for lilac heels. Jogging pants, an oversized sweater, and a big chunky scarf – is there any outfit more comfortable and cosy for those chilly days when you would rather be at home. Team your grey sweater with a pair of well tailored trousers and you have a simple, yet completely appropriate outfit for work. 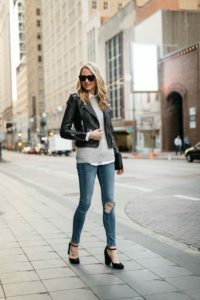 A pair of distressed jeans, contemporary heels, biker jacket and grey sweater, makes for an outfit that is always good and chic. Gorgeous! 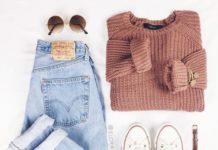 Every woman needs a cosy fleece sweater that she can throw on with her jeans or leggings when she is having a lazy Sunday or going on a long, breezy walk. Snug and lovely. I bet you weren’t aware that the grey sweater can even provide some all-out glam! Well, clearly it can as this outfit shows. 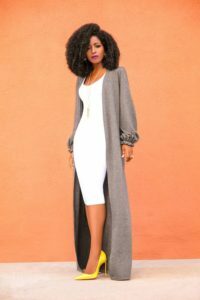 The duster shape of the maxi cardigan is stunning and the perfect complement to a form-fitting dress. Yellow stilettos? Yes Please. Who doesn’t love a fluffy Mohair sweater. Stylish and cool this grey sweater looks gorgeous with skinny jeans, but would look just as good with the likes of a leather skirt and heels. 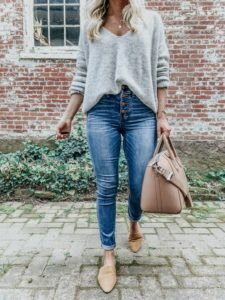 A grey sweater with some skinny jeans and colour pop heels is the perfect date night outfit, whether it is dinner and a movie, or a few cocktails. 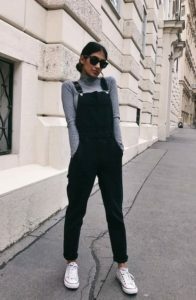 Is there a better outfit for running errands on the weekend than a sweater and jean overalls? Of course not, and this grey sweater with black overalls is such a cute and wearable outfit. Loving the classic Chuck Taylors too! A grey midi cardigan will be such a versatile item in your wardrobe. Wear over dresses, office wear, or like here with boyfriend jeans, boots, and a simple white tee. Carrie Bradshaw herself would be proud of this grey sweater outfit. The tulle skirt is super feminine and has been dressed down to perfection with a oversized grey sweater, creating the perfect evening wear outfit. The ensemble has been accessorised to perfection with sky scraper heels and mini satchel bag. 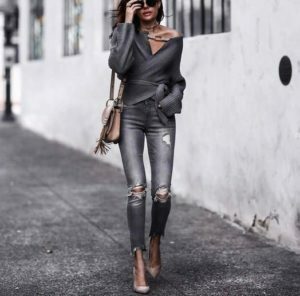 The mixed grey tones and textures of this outfit are just stunning and the statement snakeskin boots give that little something extra, don’t you think? Grey works as a neutral, which means you can team your grey sweater with almost anything. Choose a bold print like these wide-leg leopard print trousers for an outfit that really makes a statement. Can sneakers look smart? Of course they can when worn with tailored trousers and a grey sweater. Tomboy chic at its finest. Throw your favourite grey sweater over a cute dress for a casual cool look that is perfect for Spring. The sneakers and sunglasses add to the laidback vibe. 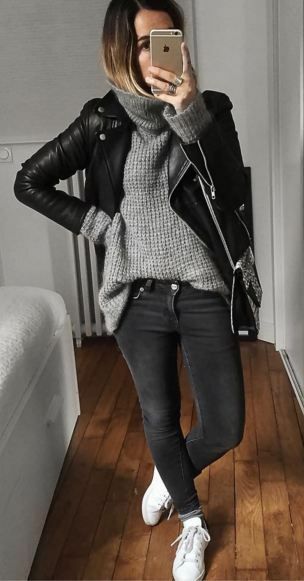 A grey sweater worn with leather trousers is such a versatile outfit. Dress down with sneakers, backpack and beanie hat, or dress up with luxe accessories and a killer pair of heels. In a world where fast fashion has made the clothing industry one of the largest contributors to landfills, it is important that we all do our parts to buy less and waste less. 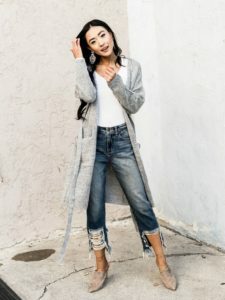 Instead of buying piece after piece for your wardrobe that you will rarely wear and will inevitably end up as landfill, invest in a good quality capsule wardrobe. Build your capsule wardrobe up of good quality pieces that can be mixed and matched together to create dozens of different outfits. A grey sweater is a must for every capsule wardrobe as it is such a versatile piece of clothing. 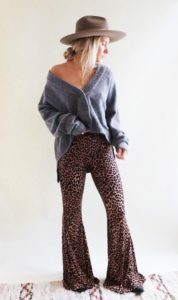 It can be worn with leggings or track pants when your having a cosy day at home, teamed with boyfriend jeans and sneakers for a casual day out, worn with tailored trousers or skirt for work, or with a formal skirt or dress for a night out. And that is just a few of dozens of ways it can be worn. What is your favourite way to wear your trusty grey sweater?